Class B tanks carried less volatile fluids such as Derv (diesel), gas oil ("red" diesel), fuel oil (for oil-burning boilers) or lubricating oil and were generally black in colour. Class B tanks were permitted to have bottom discharge outlets. Note the lack of "Highly Inflammable" warnings. This tank was fitted with a pair of heating pipes which would be connected to a static steam supply at the discharge point in order to accelerate the flow of the more viscous fluids carried. The white star, 2 feet across, at the right-hand of the tank-side, together with the cast star plate on each solebar, denotes that this wagon conforms to the requirements to run in goods trains having an average speed of 35 m.p.h. and stopping at least every 40 miles. This wagon was fitted with handbrake only. This tank wagon was built for the Air Ministry during WW2, principally to supply fuel to the numerous air bases housing the large number of Allied (RAF/USAAF) aircraft based in Britain. It was built by Hurst Nelson & Co. of Motherwell and was numbered 812 in the Air Ministry fleet. The batch was numbered 571 to 870 and was constructed between July 1941 and February 1942. All privately-owned vehicles had to be registered with one of the railway companies in order to travel on the main network and the LMS registration numbers for the batch were 162135 to 162434. Our tank was registered with the LMS as No.162376 and was star-plated in January 1942. The tanks were originally built to the RCH 1927 specification as Class A tanks (for highly flammable liquids such as aviation spirit (avgas), a high quality and high octane petrol) with top discharge via a siphon tube. After the war, those which survived were sold off, mostly to Shell Mex and BP who kept them for Class A traffic. Esso also acquired some (including this one, which they numbered 1921 in their fleet) which were converted for Class B traffic with heating coils and bottom discharge. The ladders are part of that conversion, not being part of the original specification, to discourage illegal access and theft of the aviation spirit. The fuel terminals and discharge points for this had trackside catwalks on site for access to the top of the tanks. Tank wagons retained their private ownership and were not nationalised in 1948. As larger tank wagons with vacuum brakes and roller bearings were introduced from the 1950's, this type of tank saw less and less main line service. No.1921 was donated to the Bluebell RPS by Esso in November 1977 and was initially restored by Wagon Repairs Limited at Esso's expense. A cast plaque affixed to the vehicle records this. The wagon arrived on 25th. April 1978 and was formally presented on 3rd. May. 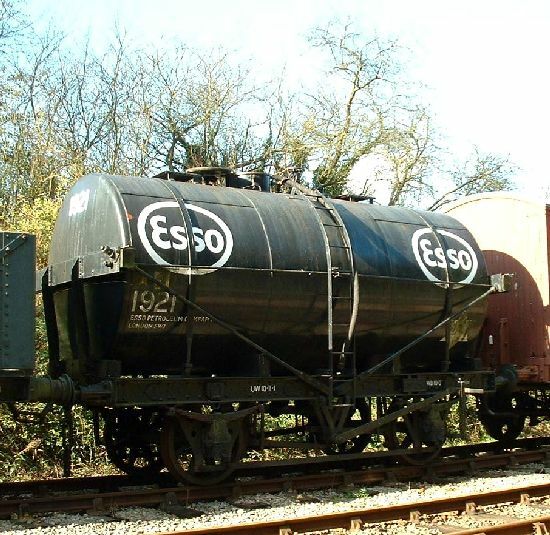 Esso 1921 is part of our vintage wagon fleet and can be seen in operation on Goods Train Days. Photo and text © Martin Skrzetuszewski. Additional research by Martin Allen. Page last updated by Nick Beck, 01 June 2015.